The state of Vermont was the 14th State to join the Union. 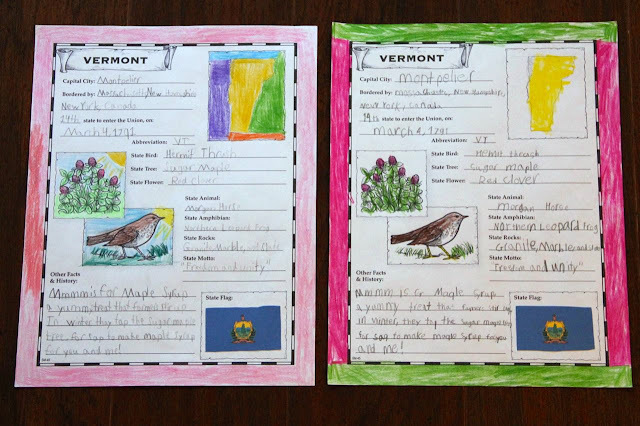 For this state, the girls read M is for Maple Syrup: A Vermont Alphabet and then completed their Notebook Pages. a yummy treat that farmers stir up. 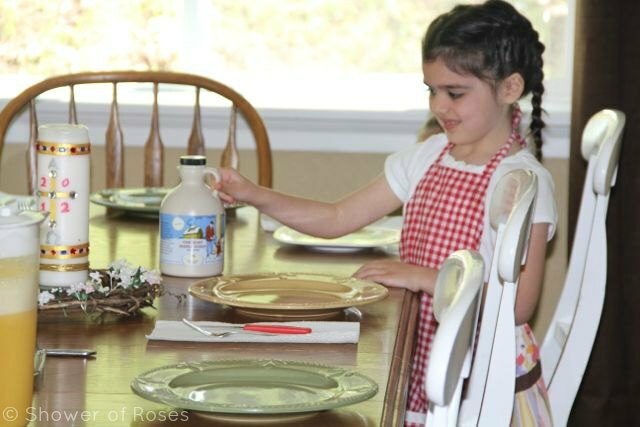 for sap to make maple syrup for you and me!" We usually just buy our maple syrup at Costco (Kirkland Brand) but for this state we decided to try something new and order some real VERMONT maple syrup. After our taste test, everyone agreed that the Vermont syrup (we tried the Hidden Springs Grade B) was the best - full of flavor simply amazing! 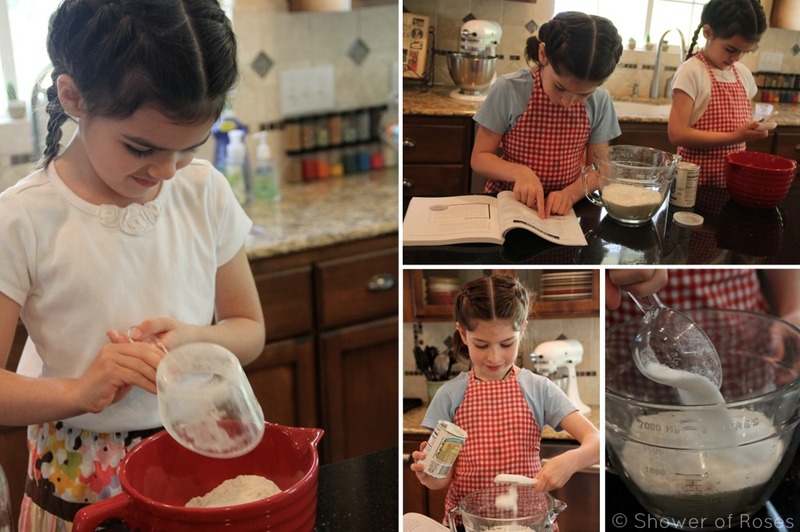 Note: We ended up making a double batch - the girls each made their own! One batch wouldn't have been nearly enough for our family! 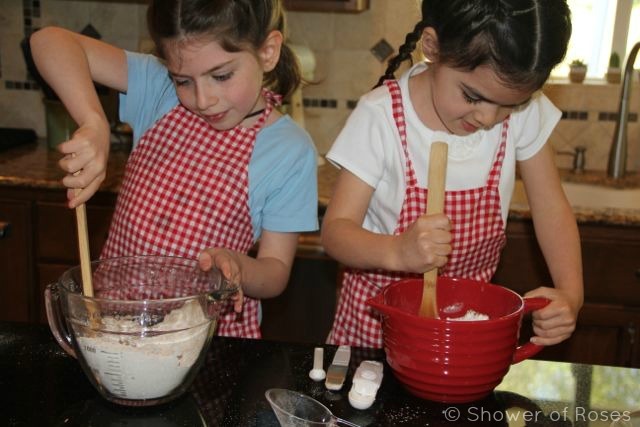 Combine the flour, baking powder, nutmeg, cinnamon, salt, and sugar in a large mixing bowl. 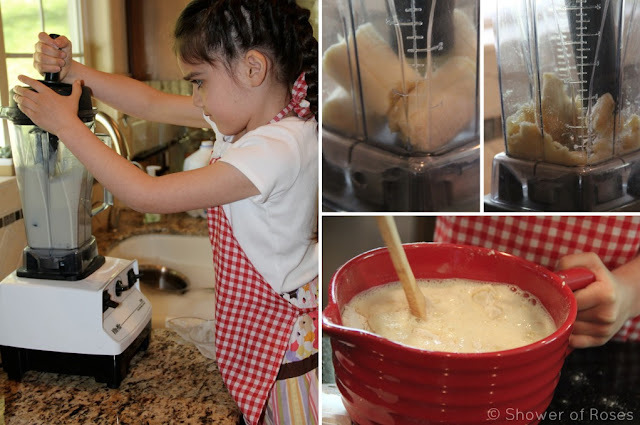 Break the bananas into small pieces and blend at high speed until smooth. 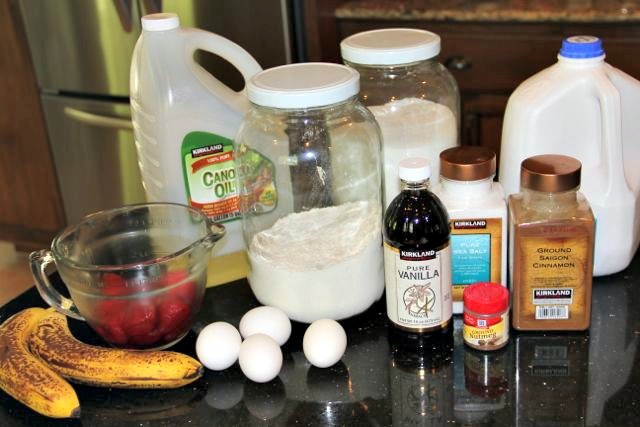 Add the milk, eggs, and vanilla to the bananas in the blender. Blend again on high speed until smooth. Pour the banana mixture into the bowl with the flour. Stir gently until just moistened. Add oil and stir. 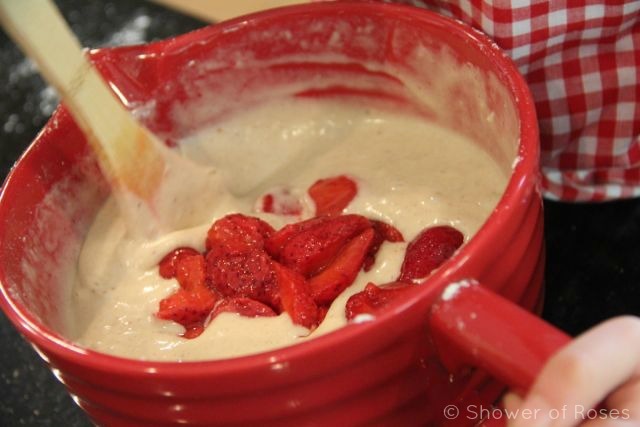 Fold in strawberries. Grease pre-heated griddle with butter or cooking spray. 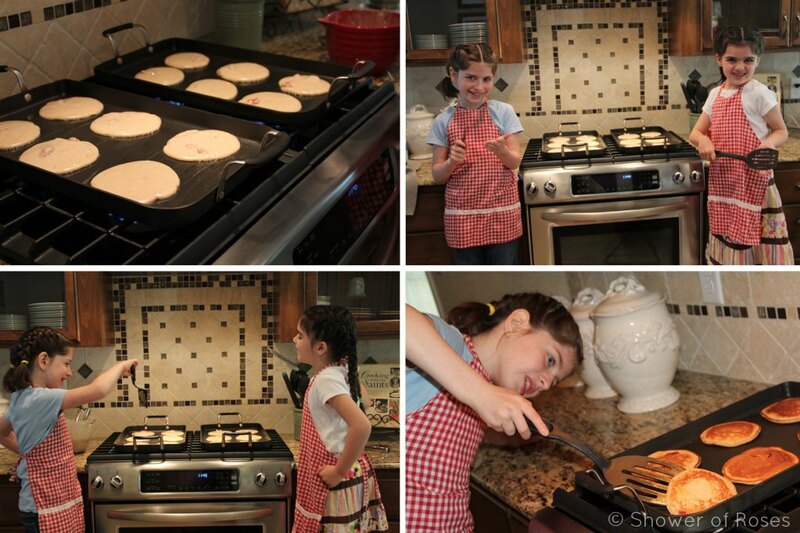 Place 1 heaping tablespoon of pancake batter on griddle for each pancake. Cook for about 2 minutes or until the surface of the pancake is bubbly. 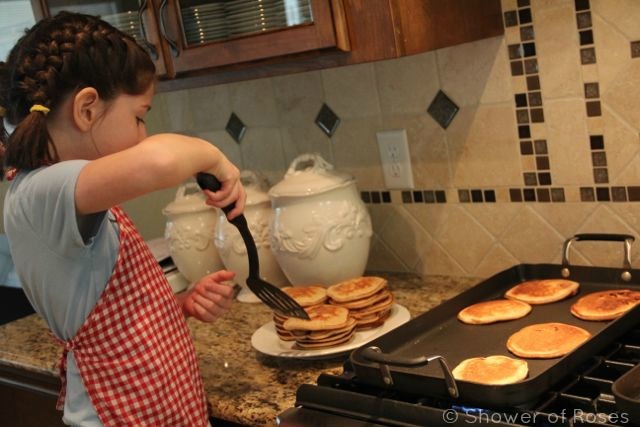 Flip the pancakes and cook for about 1 1/2 minutes, or until golden brown. Serve hot with Vermont Maple Syrup! Oh Jessica! You just KNOW I'm going to comment!!!! LOL!! :-) Being a native of Vermont and having come back here after university and a few years in England, I simply LOVE LOVE LOVE my home state, it's people and of course it's MAPLE SYRUP - LIQUID GOLD!!!! Our sugar maple tree is in full orange/red now and is just gorgeous! Autumn is just about at peak in the lower elevations now! Do get some "Grade A" syrup - it can be a bit sweet, but if any of you have a sweet tooth, try it! And the maple candy is wonderful, too! One nice treat in Autumn is pumpkin pancakes!!!! YUM!! Vermont got hit hard by tropical storm Irene last Aug 28th and we had many covered bridges that got damaged or completely destroyed. The Weather Channel's Jim Cantori is a native of our little state and he came here to cover the storm when he saw what it was doing to us - and they sent a reporter to Woodstock, VT today to cover foliage season and talk about all the recovery efforts since the storm last year - it was soooo wonderful to see them here again and the beautiful town of Woodstock that got hit hard in that area. 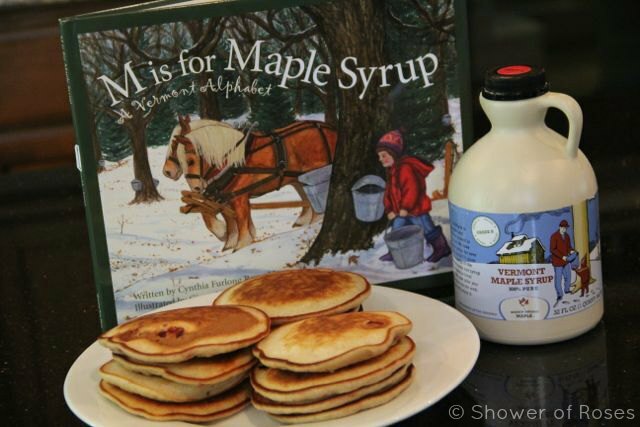 I bought "M is for Maple Syrup" for my daughter this year to study and can't wait to "dive in" with her! Another GREAT book from that series is "V is for Von Trapp" - the Sound of Music family that fled Austria during WWII and settled in Stowe, VT. I think your older kids are studying that era of history?????? I'll be reading THAT book, too and catching the movie as well! A trip to Stowe may be in order, but it's quite a bit of a drive - it's "up there"! Oh, and in the winter we have this little "ritual" of "Sugar on Snow"! Get some snow (clean, of course!) and put it in a cup or bowl and drizzle maple syrup all over it! It's amazing! Ooh! Pumpkin Pancakes with Maple Syrup... That sounds like something we are going to have to try! Soon! I've been eyeing V is for Von Trapp for awhile now and was planning to purchase it for our WWII Study later this year. Until now my focus has been on collecting all the state books. I just have one more to purchase and we'll have all 50! Thanks for emailing the picture of the tree! I'll be sure to share it with the kids! I hope you all enjoy "V is for Von Trapp"! They settled in Stowe, VT because it reminded them of Austria, I understand. There is a lodge that the family started there and it's online - just google the Von Trapp Family Lodge and you can see it. They did, and the colors ARE beautiful, even with the mild weather from last year! Just gorgeous! Have you read The Story of the Trapp Family Singers? My grandparents gave me a copy as a child, which I had until the binding fell apart, then I purchased the new edition about 10 years ago. I still need to read it! Your comments reminded me! I wonder if it is one my children would enjoy as a read aloud... And I'll have to look up that website you mentioned. No, I haven't read that book. I'm sure you can't go wrong with it as a read aloud book for the kids - at least the older kids? I'll have to look into it - thanks for the suggestion! I have a quick question on the books, do you buy them directly off Amazon, or other sites online? I have been wanting to purchase a few for Christmas. Just curious, like your family, we have a tough time buying all the goodies we want for our homeschool especially this year. It's taken years to be able to collect all of these, and nearly all of the books I've purchased have come from Amazon, with a few coming from Ebay. When I first started purchasing them it was easier to find them drop down to around $10 new, but lately it seems like they have all been $12-13. I've purchased about 1/2 of them (at least) used. I try to find them in "Like New" or "Very Good" condition, since I haven't been thrilled with the ones classified as "Good." I've had to spend more on these last 10 or so, but for awhile I was able to find them for around $6-10 per book. Glad to know I'm not the only one who rations the maple syrup! 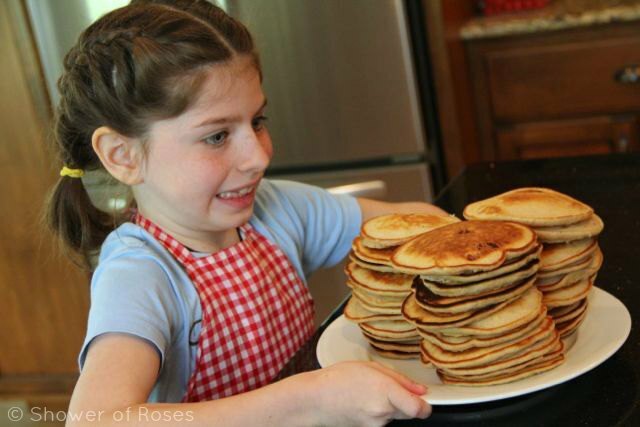 ;) These pancakes look yummy! !